Understanding footwork and angles is near the top of the list for boxers. They don't call boxing the sweet science for no reason. What some people see as a violent competition, others see as poetry in motion. 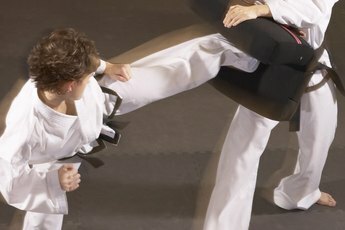 If you've trained with a qualified instructor before, you know that there's more to every technique than meets the eye. To improve your overall boxing skill, focus a portion of your training on angles and footwork. Angle drills will help you achieve the proper positioning to attack, defend and counter effectively. Before you get into the more complex angle drills, evaluate your stance and basic footwork. Shoring up your fundamentals builds a strong base from which you can expand to more difficult techniques. The most important beginner step in boxing movement is to push off with the opposite foot of whatever direction you plan to move, while lifting the other foot to complete your step. If you want to move forward, push off the ball of your rear foot. To move to the right, push off the ball of your left foot. You can practice your footwork by stepping in a square pattern, throwing a jab with each step. When you're comfortable with your footwork, the focus should shift to your upper body. Getting hit isn't a pleasant experience for anyone, which is why slip drills are so important for boxers. Drills to help you dodge punches include tying a rop from one corner of the ring to the other and ducking under it from side to side, as well as using your mirror image as a sparring partner. When slipping from side to side in front of the mirror, keep your lower half still and concentrate on upper-body movement. All the angle drills in the world won't add up to much if you can't execute your attacks, dodges and counters with a live partner. Have a coach or sparring partner hold pads for you and practice your punches, slips, blocks, ducks and counters. After each combo, both you and you pad-holder should move to a different angle and face a different direction. This will condition you to track the movements of a sparring partner in a live session. 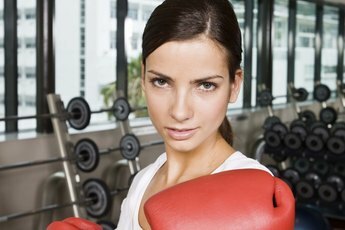 You don't need to be hit to experience some of the drawbacks of boxing training. 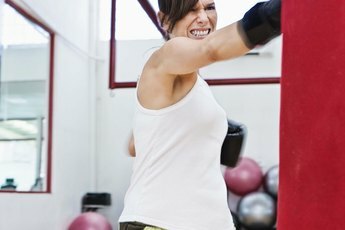 A 2007 study focusing on West Point cadets found that boxing caused the most shoulder injuries of any activity. Missed punches were the leading cause of shoulder subluxations. When you perform shadow boxing drills or drills without a sparring partner, don't put everything into your punches to avoid overextending. AAOS.org: Which is Worse -- Shoulder Subluxations or Dislocations?